Getting treatments at Bliss is one of my favorite pastimes. Even if I am in the worst possible mood, a massage or facial at one of the Bliss locations -- especially Bliss 49 -- cheers me up immediately. And part of what makes the experience so special is the amazing stone showers filled with -- you guessed it! -- Bliss products. I am totally in love with the tangy, citrusy aroma of the Lemon + Sage line, so it's amazing to me that the showers are stocked with shampoo, conditioner and body wash in this delicious scent. 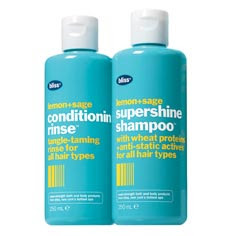 I must admit that the first time I picked up the Supershine Shampoo and Conditioning Rinse -- especially in the Bliss Supershine Shampoo + Conditioning Rinse Set -- I had my doubts. Would they really tame my wild, frizzy locks? After all, I was used to the incredibly moisturizing properties of Aveda Shampure. But one tiny squirt of these products into my hair and I was completely hooked. The shampoo is formulated with wheat proteins and anti-static properties, so it really leaves hair feeling glossy and smooth ... and the conditioner detangles, defrizzes and generally destresses tresses immediately! In addition, each of these miracle-workers contains Panthenol, which is a Vitamin B5 moisturizing agent that binds to hair follicles and smooths strands without making them feel greasy or oily. All in all, my locks have never looked better. They're shiny, they're smooth, they're all-around fabulous! The Bliss Supershine Shampoo + Conditioning Rinse Set retails for $36 at blissworld.com.